Too Fat Lardies have some new downloadable Force Morale trackers for their Dux Britanniarum game. The Force Morale system in Dux Britanniarum is a key part of the game and is easily tracked by a D6 or two on the table edge. 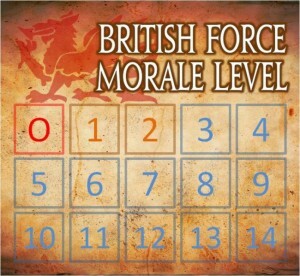 However, a far smarter arrangement is to use the Force Morale Trackers designed for the rules and great when used with a suitable figure placed on your current morale level. I like to use a Priest for the Romano-British and a Wicca or Shaman for the Saxons.